“Comfortable” and “walkable” are two words that quickly come to developer Ralph Conti’s mind when asked to describe what people will experience in Celebration Pointe. Conti is creating a mixed-use development of stores, apartments, offices, a movie theater, a hotel and restaurants, adjacent to Interstate 75 between the Archer and Newberry road exits. The developers are building a bridge over the interstate to provide additional access to the 125-acre site. Conti said he and his business partner are bringing an urban feel to a piece of real estate by eventually building 1 million square feet. “I don’t want to say that it’s going to replace downtown Gainesville, but you know it’s going to have a lot of characteristics of an urban center,” he added. Hotel Indigo, a worldwide boutique chain with four other hotels in Florida, including Jacksonville and Miami Lakes, will build a 137-room hotel with meeting space. Bass Pro Shops will bring its first store to the area, with an expected opening this November of the 100,000-square-foot store. Regal Entertainment will build a 10-screen luxury movie theater with reserved seating and food choices not found in most theaters. InfoTech, a software firm in Gainesville, will start construction this month on a 60,000-square-foot headquarters building for 240 employees. Celebration Pointe will include 200,000 square feet of outlet stores. With one mile of frontage on Interstate 75, its developers hope to draw some of the 114,000 vehicles that use the road daily. Also available will be a “menu of residential opportunities” such as urban flats — 250 to 260 rental homes that will sit above the retailers, Conti said. “They will be fully integrated into the Main Street component,” he added. Elsewhere will be more traditional garden-style or multiple-story apartment units. Eventually there might also be townhomes for sale. 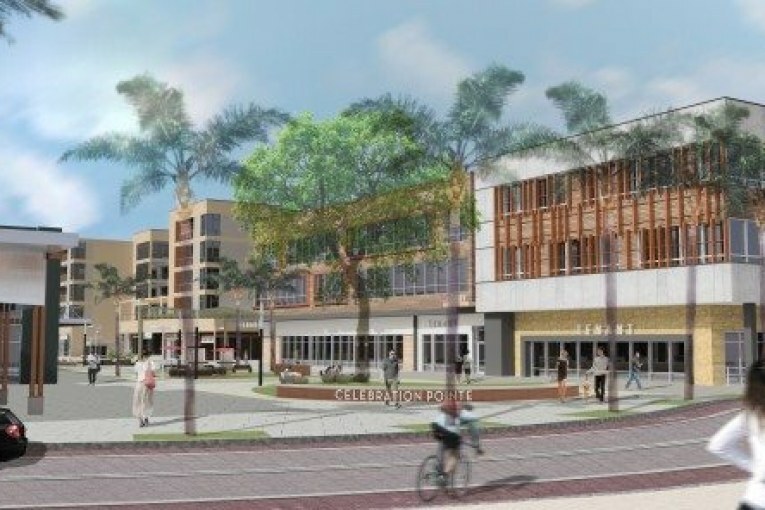 Another project amenity is the proximity to a 700-acre conservancy area to the west that will include the Archer Braid walking and biking trail that eventually will connect Haile Plantation with the University of Florida campus. “We’re going to be the missing link for it. We’ve designed it to come through our property and go over the bridge we’re building,” he said. The bridge will carry Southwest 30th Road over the interstate to connect with Southwest 42nd Way, providing easier access for shoppers from areas east of I-75. Residents from the other side will find two entrances off Archer – Southwest 43rd and Southwest 45th streets. The bridge will include a pedestrian walkway, bike path, a rapid transit lane and multiple vehicle lanes. Conti, principal of RaCo Real Estate in Atlanta, said visitors will find Celebration Pointe comparable to SoDo in downtown Orlando, which he also developed. Some of his other successes include a mixed-used development in Bridgeport, Conn., called Steelpointe Harbor, a 2-million-square-foot waterfront development. Conti is confident the Gainesville area is primed for Celebration Pointe. Dyrkolbotn, whose company has built numerous residential developments in the Gainesville area, agrees. “Given the location of the project, no other site in the market can re-create what Celebration will be either now or in the foreseeable future,” Dyrkolbotn said. Retail expert Steven Kirn said he thinks there will be great interest in the mixed-use model in this region, given the fact there are many students, retirees and university types. Kirn, executive director of the David F. Miller Center for Retailing Education and Research at UF, said mixed-use developments have supplanted the “golf course model” in many places. Metra is the commuter rail system for suburban Chicago. Conti said construction for the InfoTech building is expected to start this month. Bass Pro Shops will break ground this month, followed by Hotel Indigo in the second quarter of this year, Conti said. Regal Entertainment wants to open its cinema in 2016, he added. “Our goal is to open the Main Street part of the retail project sometime in 2017,” he said. Dyrkolbotn predicts the project will extend its impact beyond the project.